These weeks are flying by again. Only 5 weeks to go until school is out. That means only 5 more weeks of being at the mobile home during the week and only 4 more weekends of traveling between the house and mobile home. I wonder if the dogs will miss the car rides. I will not miss being at the mobile home as it is now. I am looking forward to the day that I can move out there permanently and have the time and money to fix things up the way I have been dreaming about for years. Last week, my nephew took the ACT test. It will be a few weeks before he finds out how he did but he is hoping for a score higher than 21 which is the score he needs for the college that he wants to go to. If not, he will take the test again. We spent the last 3 Saturdays going to his ACT prep class so I hope that preparation paid off. 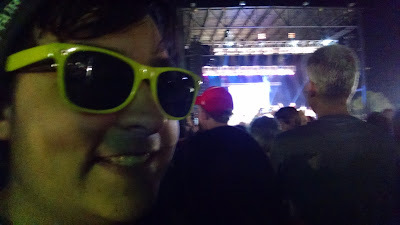 On Wednesday, we went to the county fair to see TobyMac in concert. I was not impressed with it but then hip hop and rap are not my style of music. It was so loud. I wonder if my hearing is permanently damaged. My nephew thought it was ok. He has to write a 2 page review on it for his choir class. We didn't get home until 10 and I didn't get to sleep until 11:30 because of the caffeine I drank for dinner. The rest of the week I was dragging. So, last Sunday, I finished my taxes and it turned out that I am getting $150 back from Federal and $500 back from the state. I was worried that I would owe money like last year but I think that my rental house being vacant for 2 months and then having to pay the maintenance costs for the tenant turn-over reduced my tax liability. For state, I pre-paid $400 last December, half to my nephew's school and half to our parish school so I get that money refunded. That was a huge relief that I didn't have to pay. I really wanted to stay home last Saturday, and, since the tax worry was over, I decided to treat myself to a little present. I could stay home if I had a plan for finishing the barn-shed painting. I used my credit card rewards to buy an electric paint sprayer to paint the grooves on the barn-shed. The idea is that painting will go much quicker with the sprayer which made it ok to stay home on Saturday. We will see if that is true. The paint sprayer arrives today. Saturday was lovely. I napped, pulled weeds, attempted to get on the roof to start up the evaporative cooler but found that my ladder was too short. Next week I will bring out my tall ladder. I've never started up my evaporative cooler by myself but everyone tells me it is easy and I can do it myself rather than pay someone $50-$80 to do it for me. This week I am looking forward to getting my paint sprayer, starting up the evap. cooler, and attending a meeting about the career-shadowing project that my nephew has to do next year. A meeting for next year's senior parents already! He wants to do the project on playing video games professionally but he doesn't know anyone who does that so he might have to pick a less glamorous occupation to research. Reality gets in the way of dreams sometimes. My sister is a tax accountant. I hate doing taxes. I am sure I do it wrong every time. I use an online program because it is cheap and it calculates my rental house taxes for me. Investments drive me crazy. Dividends and cost basis stuff are too much for my little brain.